Welcome to eastwestmusic.net - the website of pianist, rebab player, and composer Larry Porter. Larry Porter is an adept in the music of both East and West. As a jazz pianist, his playing pays homage to the history of the music, from ragtime through post-bop and into the future. As a rebab player, Porter has been hailed as "...without a doubt one of the best of his generation" by the US-based Afghan magazine, Lemar-Aftaab (read interview). In both spheres Porter's compositions, renditions, and improvisations portray multi-dimensional visionary soundscapes conveying the depth and breadth of emotions that encompass the human experience. He is also involved in projects integrating aspects of jazz and other Western music forms with Afghan, Central Asian, and Indian music. On his arrival in Afghanistan during his 1976 journey through Asia, Larry was captivated by the music of "...a land where music still truly reflects the soul of the people". 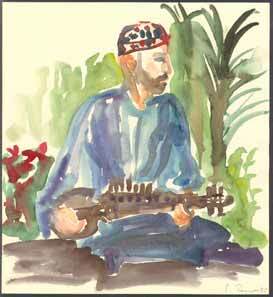 He was particularly entranced by the rebab with its mellow resonance and contrasting percussive quality. The rebab is a short-necked lute with 18 strings. It is a traditional instrument of Afghanistan and the surrounding area, and is the precursor of the sarod. In Persian, the first vowel is not written, giving rise to a variety of Western spellings, including rabab, robab, rubab, and rhubab. The name stems from ru = soul, and bab = gateway - the instrument and its music are truly a gateway to the soul. During his stay in Afghanistan, Larry was the student of Ustad Mohammed Omar, acknowledged as the greatest rebab master of his time and the foremost proponent of the Afghan classical style. Over the years Porter has developed a unique style which combines folk traditions with elements of classical Afghan and Indian improvisational styles. His repertoire includes Afghan folk songs, Hindi film tunes, Pakistani ghazals, and classical Afghan and Indian compositions, as well as original pieces composed in the Afghan style. Larry Porter's jazz credentials are impeccable. Porter began taking piano lessons at the age of six. His studies included stints at Eastman School of Music and Berklee College of Music. Since then he has lived and worked in New York City, Munich, Barcelona, and Berlin, where he currently lives. Over the years he has played with such major figures in the music as Thad Jones and Archie Shepp, including extended periods with Chet Baker and Art Farmer. Porter has also had wide-ranging work with such world-class singers as Sheila Jordan and Mark Murphy. He has made numerous records as a side-man and under his own name. 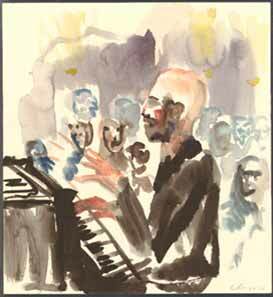 Larry has successfully lead trios and quartets, including the legendary Porter - Praskin Quartet. He excels in composing and arranging for such small groups, but his writing range extends to include vocal and chamber music, along with works for solo piano and big band. He is also an accomplished lyricist, integrating appropriately affective words into his expressive compositions. The pieces presented on this website are a representative cross-section of three decades of resonant multiform creativity. They exemplify the exquisite depth and range of Porter's writing and playing in solo piano, duo, trio, quartet, big band, formats. Larry Porter is striving to create a sort of amalgam of East and West. His goal has been to "...combine everything I know about jazz and Western music with everything I know about Afghan, Central Asian and Indian music. It is of utmost importance to me that an actual transformation takes place in this fusion and not just a layering. I hear this music as having its own integrity different than the mere sum of its parts." This website offers music in Flash Player streaming audio format, thus giving the listener a true sense of the artist. The visitor can listen to performances of a master musician whose musical career spans some thirty years and three continents.